Home Health & Medicine Can glucosamine help dogs with arthritis? Can glucosamine help dogs with arthritis? Some say, “Absolutely yes!” Others say, “Not so much.” Like so many things in health and medicine, the research is limited and contradictory. That said, Fido has had a huge improvement in his ability to move without pain after starting the Cosequin single strength that his vet prescribed. He used to regularly have days where he would get up in the mornings stiff, slow and wincing when his shoulders or hips were touched. These days, even when its cold or damp, Fido gets up ready to roll. Think of the shells that shrimp, crabs, lobsters and insects have. They are all made of glucosamine. In fact, processed crustacean shells are used to make glucosamine that people and pets take for arthritis and other aches and pains. It can be found in our bones, finger and toe nails, tendons and ligaments, skin and heart valves. It is usually mixed with sulfate to make it more available to the body to use. While European countries consider glucosamine sulfate to be a safe and effective medical drug, in the United States it is classified as a dietary supplement. That means that it is not regulated by the Food and Drug Administration (FDA). It is entirely up to the manufacturer to show that it is safely formulated. No proof of its safety or effectiveness is required unless it’s advertised as a treatment for a medical condition. What happens when a dog gets arthritis? The ends of bones where they meet in a joint is covered with a slick material called cartilage that helps the bones glide as the dog moves. Some joints are enclosed with synovial fluid bathing the cartilage and helping to cushion the bones during movement. But as a dog gets older and has put some miles on his joints, the cartilage gets nicks and tears, scars and calcium deposits from repetitive movements, injuries and twists and strains. No supplement can repair or fix those issues. These irritations in the joint cause inflammation. When inflammation occurs, enzymes are released that can damage the joint event more. Glucosamine sulfate, fish oil and other supplements can help reduce inflammation, which makes it easier and less painful to move a joint. Raw food diets tend to be richer in glucosamine than cooked, processed kibbles and canned food. In severe cases, a vet might prescribe steroids or non-steroidal anti-inflammatory drugs (NSAIDS), which we know as aspirin, ibuprofen and similar over-the-counter pain relievers. Steroids can have side effects that include making joint problems worse; NSAIDS can cause stomach bleeding, ulcers and liver and kidney problems. Some vets argue that glucosamine should be given starting when a dog is one to two years old to prevent joint damage. Most of us, however, don’t even see a problem until the damage is done and the dog gets stiff or appears to have pain. For us the Cosequin made a significant and positive difference in Fido’s ability to move freely. I am not a veterinarian and our experience is just that of one person and one dog. 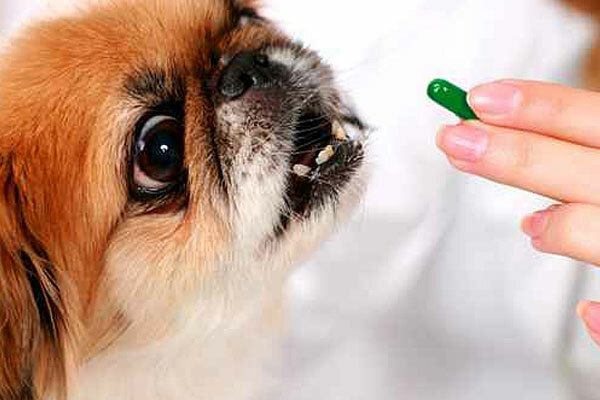 Here are our tips if you’re considering giving your dog glucosamine. Talk to your vet about the situation you’re observing with your dog. Keep a log of when, how often and how severely symptoms such as stiffness, changes in how your dog walks or a reluctance to be touched. Many conditions can cause similar situations. Your vet can make the best decisions and diagnosis of your dog’s specific case. If your vet recommends trying glucosamine sulfate, discuss brands and doses. Not all glucosamine sulfate is created alike. This is one area where the lack of FDA supervision makes it difficult. The best product is not always the most expensive one. Your vet is the best source of information. If your dog has other health issues or is taking other medications, be sure to ask your vet about possible interactions. Dogs that have trouble with bleeding or have diabetes might have problems with glucosamine sulfate. It can make it harder for blood to clot and may increase blood sugars. Be patient about results and monitor your dog’s reactions. Glucosamine sulfate is not magic. It doesn’t create overnight results. Many drugs require time to build up in the blood stream. Keeping a log noting how many days of stiffness or pain your dog has after starting the medication can help you decide whether to continue taking it. It’s also important to note any side effects such as diarrhea, vomiting, gas or loss of appetite or energy.